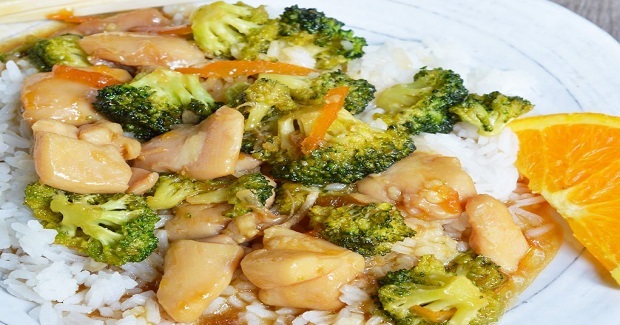 Orange Soy Chicken Broccoli Recipe - Gutom Na! Posted on Thursday, March 9th, 2017 at 5:35 pm. Mix soy sauce, water, fruit spread, sugar and cornstarch mixture. Set aside. In a large wok or saute pan, heat 2-3 Tb cooking oil over medium/high heat. Add chicken and fry until almost cooked through.Remove from pan and set aside. Add a drizzle of cooking oil and broccoli florets to pan. Fry for 2-3 minutes while stirring. Return chicken to pan and add sauce mixture. Cook 5-6 minutes or until sauce thickens and chicken is cooked through.